Miniature painting looks tedious and hard, but that's far from the truth. With the understanding of the process and techniques, you can get stunning results (really!). High-grade Citadel paints coat and dry beautifully - you just need to know the steps to apply (base, layer, wash), and how to apply (ie. thinning paints). A great miniature painter is Sorastro. He produces high quality videos that's easy for beginners to follow. In this video, he's showing us how to build and paint a 'Games Workshop Build+Paint Space Marine Bike Attack'. Inside this kit is everything you'll need to get started. 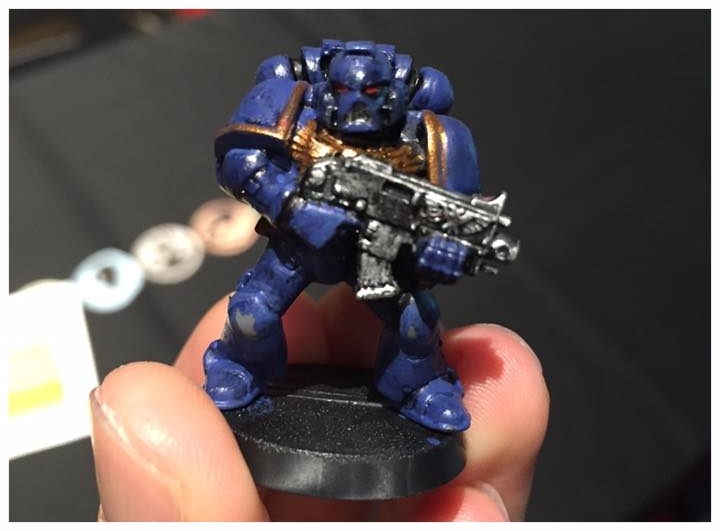 My first miniature - no brush control, thick application of paints. My second miniature - better control overall, and understanding. I still need more practice with the highlighting. Just take your time and enjoy the hobby. If you need guidance or help, please approach our friendly team at the store.